Debbie Thomas of Grangewood Copywriting interviews Alison Hitchen of Fab Accessories about her inspiration for starting the business, and how the tragic death of her boyfriend and business partner has motivated her even more. I’ve always been ambitious and I was hugely proud of what I’d accomplished in my career. As a retail marketer I’d worked with brands like Focus DIY Ltd and Ryman Stationers. I’d worked with national media titles and controlled nationwide campaigns, managing over £8 million of sales per month. I’d been fortunate to win various awards including ‘Business 2012’ when I had the pleasure of meeting Sir Richard Branson for business advice. Life was going well. And then things took a sudden tragic turn. My boyfriend John Wilkins was born with a rare heart defect – and he had absolutely no idea of that fact until he passed out at a gym session in 2009 at the age of 24. His heart was being incorrectly piped and he was told he would only have 2 years to live if he didn’t have open heart surgery. So shortly after his diagnosis he underwent the operation to re-pipe his heart to enable the blood to flow correctly. The surgeons hoped that would sort everything out. It didn’t. His condition didn’t get any better and he was constantly tired and out of breath. So it was decided he needed to have a pace maker and defibrillator fitted in Wythenshawe Hospital in 2014 – and we were delighted when that significantly improved his condition. What was evident though was that John couldn’t continue to work in his role as a mechanical fitter for Lancashire County Council and he was going to have to take ill health retirement. And that was when we conceived the idea of Fab Accessories together. I was a huge fashion lover and given my marketing expertise it seemed like the ideal business to create between us, offering gorgeous designer accessories online. We started the business in August 2015 and it felt as though we were getting everything on track. And then my world shattered. On the 22 October 2015 John woke up feeling unwell. His lips, hands and feet had turned blue and he said he felt strange. John was taken to The Royal Blackburn Hospital at 11.30am where they were treating him for a chest infection. At 2pm John had a cardiac arrest. The staff worked on John for 45 minutes. But he never regained consciousness again. He was just 30 years old. It was devastating. John was my rock. To look at him, you would see a very healthy person. He’d always taken good care of himself. My world fell apart. There is no quick fix to dealing with a situation like this. You focus on coping moment by moment, day by day. It took a huge amount of time before I managed to even contemplate a new normality without him. Part of that process – and the mission I am now on – is recognising you can do something positive to help others in similar circumstances. I started to realise that by finding ways to help others affected by cardiac conditions, I was also finding a way to deal with my own personal loss. The entrepreneur in me had always wanted to make a huge success of the business. But suddenly I had a whole new purpose behind me. It was a way for me to keep going. It is a way to keep John’s memory alive. I am now on a mission to make a difference and I’m doing that by giving back to the cardiology department at Wythenshawe Hospital (where John’s specialist is based) by donating 10% of all sales from Fab Accessories to them. John loved all the team there; when he felt unwell, the first person he’d contact was his nurse as he completely trusted her. My commitment to helping people with cardiac conditions has since led to me recently taking on the role of official fundraiser for the British Heart Foundation as well. Fab Accessories is going from strength to strength. 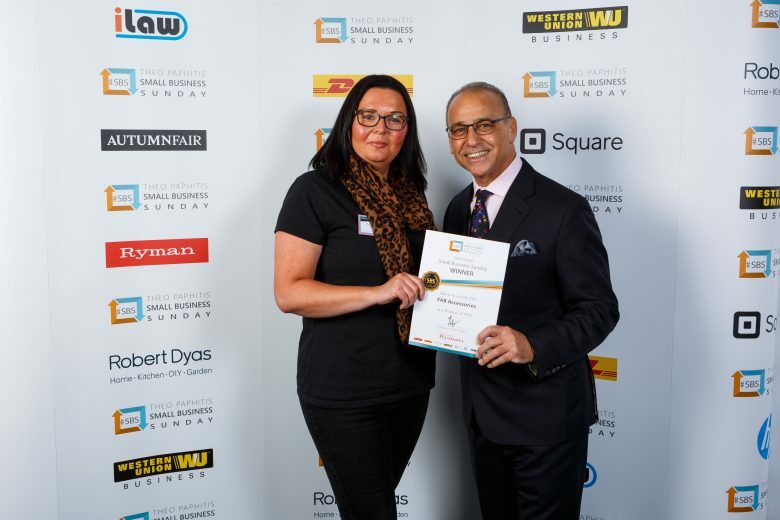 It’s developed a substantial following on social media and in February 2019 I went to meet Theo Paphitis to collect a Small Business Sunday award. I’m currently expanding FAB Accessories both on and offline across the UK to build on the success of the award and to continue raising much needed funds for cardiac care. At the moment I’m busy searching for salon owners who are interested in stocking my accessories to earn extra income while supporting a great cause. I have lots of plans to make the business as successful as possible and at the same time to make it a business with a mission that is about so much more than just commercial success. I know John would be so proud of everything we’ve achieved – and of everything I intend to achieve because of him. You can find out more or get in touch with Alison on the Fab Accessories website.